The good folks at Mollie Stone’s have asked me to provide a quick primer on Scotch and weigh in on a personal favorite. Because, delicious as it is, Scotch can also intimidate. For instance, is it a whiskey? What’s a single malt? And why do some of them taste like a runaway Band-Aid fire? Fair questions all. To the first: yes, but technically, it’s whisky. In letters, as in so many things, the Scots had to go their own way. The Irish and the Americans remain fond of the “e”. As for the rest, let’s back up. Father’s Day is around the corner. We want to get this right. The word whisky is an English mangling of the Gaelic uisge beatha (which in turn is a translation of the Latin aqua vitae, that aply-named water of life). And while the Scots weren’t the first to distill uisge, they can claim the first written record of its existence, in 1494. What those tippling pioneers were doing then is not vastly different from what Scotch whisky distillers do now: make beer from a mash of barley malt, and distill that beer in copper pot stills. Later, when they discovered the benefits of aging the firey stuff in oak casks, the liquid’s true potential was unlocked. Casks of single malt mature in a whisky warehouse. Today, Scotch Whisky is very tightly regulated. To be called such, it must be produced entirely in Scotland and aged in oak, on Scottish soil, for a minimum of three years. Younger than three years, the Scots don’t even deem it whisky. That’s commitment to the cask, people. And there are two major categories to consider: Blended Scotch Whisky and Single Malt Scotch Whisky. Blended Scotch is the global heavyweight from a volume perspective, and has the most famous brands in its stable (Johnny Walker, Dewars). These whiskies are so-named because they are the result of blending dozens of single malts from different distilleries with a lot of lighter, thinner grain whiskies (typically corn) taken from column stills (as opposed to pot stills). Most of the liquid in a blend is composed of grain whisky, but the defining characteristics of any—in my humble opinion—come from the chosen malts. Which brings us to single malt Scotch whisky, the elixir that most resembles what the highlanders were ripping right off the still back in the day. A single malt Scotch must be wholy the product of a single distillery, using only malted barley in the mash, and distilled in traditonal copper pot stills. These whiskies are distinctive, rich, and deliver the unadultered personality of their distillery. 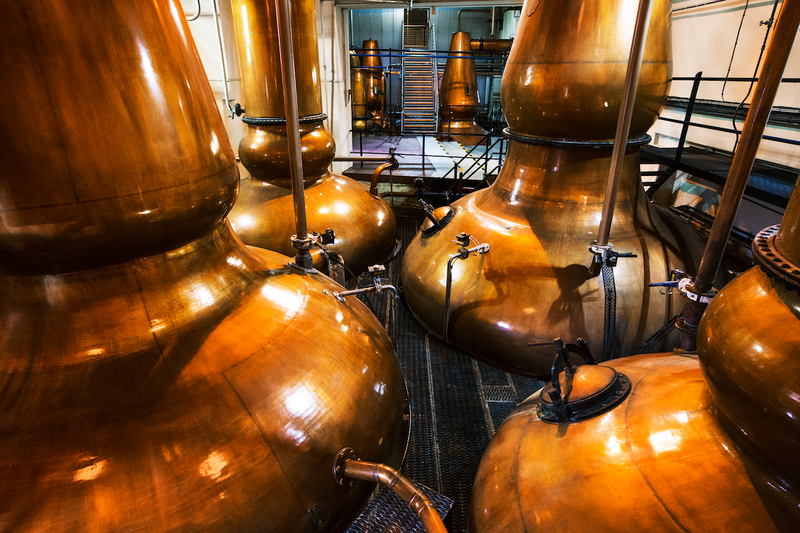 Pot stills, with their bulbous bases, inside a modern distillery. Pot still distillation is one of the requirements for making single malt Scotch. For the Scotch enthusiast, a map of Scotland is less about cities and more about the different whisky drinking regions (yeah, they have those). And while regional difference may be more about long-standing traditions than about “terroir,” it’s still a helpful tool for navigating the vast landscape of flavor out there. The are five officially recognized whisky-producing regions in Scotland: The Lowlands, The Highlands, Speyside, Campeltown, and Islay. A sixth, The Islands, is technically claimed by The Highlands, but most now think of it as a separate region. 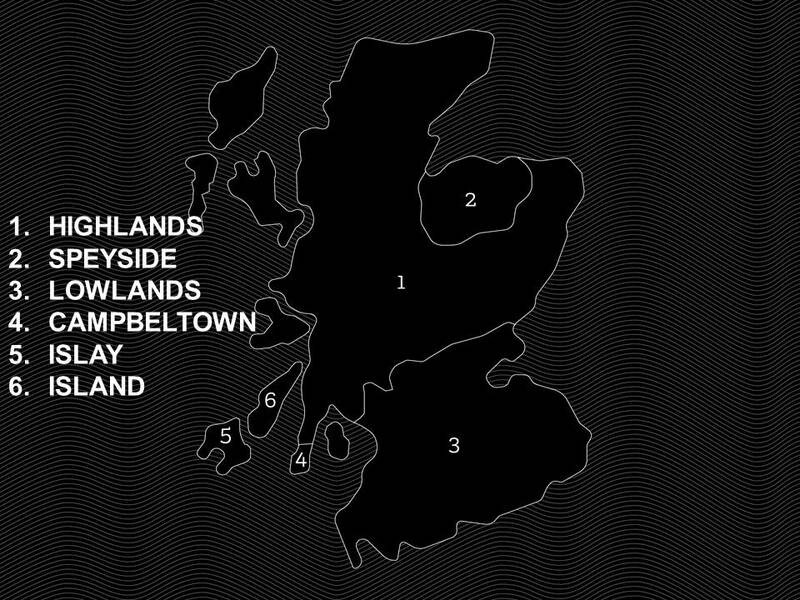 The whisky producing regions of Scotland. Assumptions can backfire, but in general, you’ll find intensely smoky whiskies on Islay (where peat smoke is used to dry the malt, lending it that aforementioned whiff of bandaid fire), delicate drams in the Lowlands, briny and muscular offerings from Campeltown, famously rich and honeyed whisky in Speyside, and whiskies of almost every shade between across the wide-reaching and rugged Highlands. 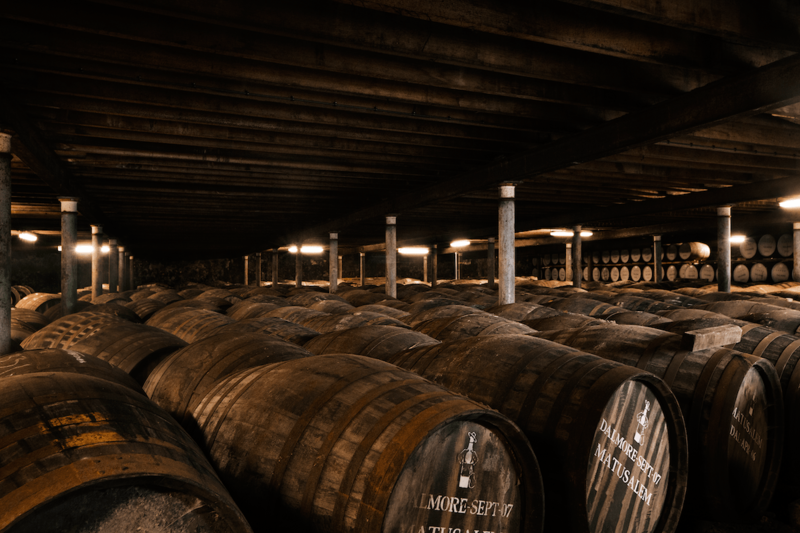 No doubt, many of the most iconic names in Scotch whisky are nestled in the Speyside valley. That’s where most whisky tourists—understandably—flock. But further north, the curious will be well-rewarded with the elegant and highly prized whiskies produced about twenty miles outside of Inverness, at a small distillery known the world over as The Dalmore. 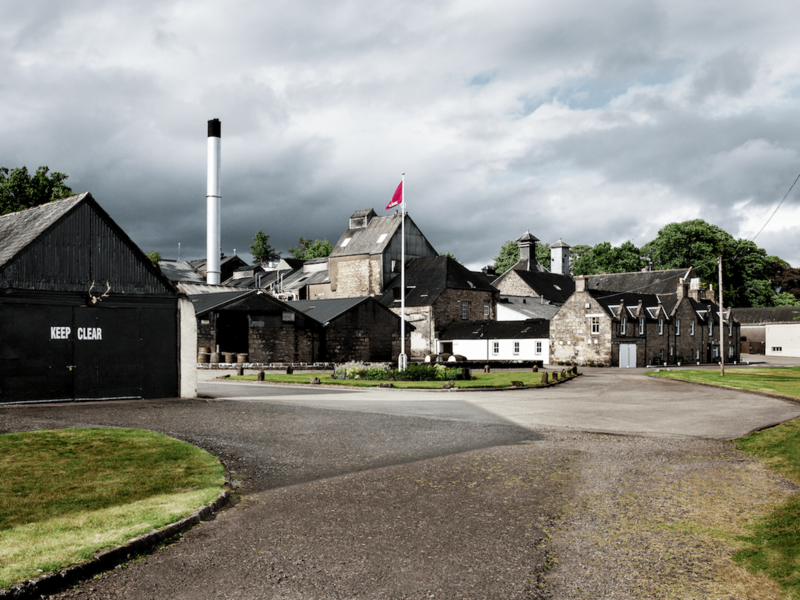 The Dalmore distillery, in Alness, in the Northern Highlands. Next week, I’ll dig into the history, royal heritage, and unique production methods that make The Dalmore’s single malt so worthy of consideration. Meantime, all this writing about whisky is thirsty work. It’s time for a dram. 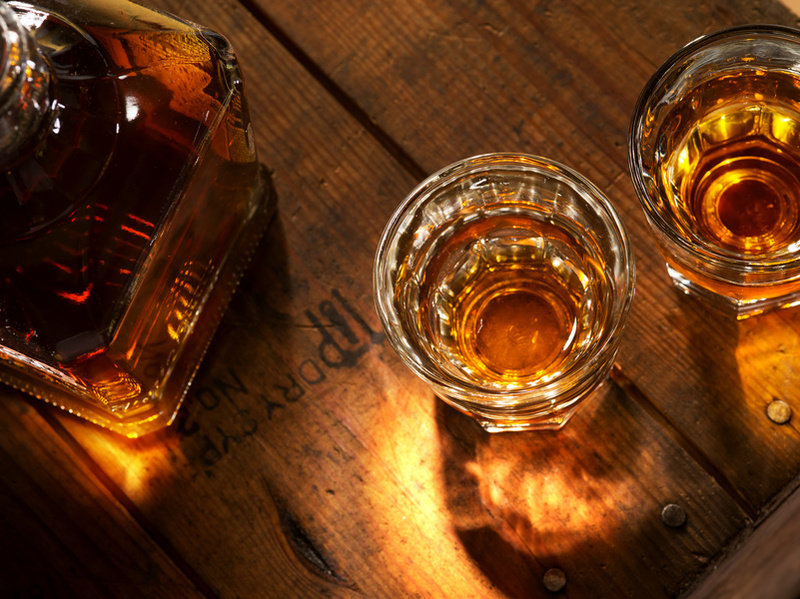 Do you have a fun fact about Scotch or Whiskey? Let us know in the comments below! Learn more and follow Whyte & Mackay!